The following is a sponsored post for Enlist Moms. All opinions are my own. As a teen, the one thing that used to drive me quite crazy was haven to check in with my mom. Seriously, I used to get so embarrassed and annoyed when she would ask me to call her from a friend’s house. This was way before the time of cell phones and even beepers, too. So, not going to lie many times, I would just not call her, because it cramped my style and also because I was just that stubborn as a teen. But now fast forward to 2014 and everyone has a Smartphone – even my dear old mom! Yes, mom uses smartphone for many things, including Facebook. And now that I am indeed an adult and 37 years old – definitely not a teenager, but still not just my mom likes to know that when I go somewhere that I got there safely, as well as that I am returning shortly, too – usually my husband and kids by extension more so want to know. So recently, I was asked to test out and try a new app called, PlaceUs, which a new ground-breaking app from the brainchild of Sam Liang, who was lead architect of Google’s location platforms available on iTunes or Android. This app truly makes communicating easier and relationships that much more easier and simple. How you may ask does PlaceUs help relationships? First and foremost, it is free app that once downloaded and your family and friends download, too sends push notifications when a connection arrives or departs any place, including work or home. But then how does PlaceUs work? It seamlessly allows you to keep track of your family on a private map, locate your loved ones through GPS, and know when they get to where they are going. But is PlaceUs really that easy to use? You don’t have to worry about time-consuming check ins when you arrive places. You can set it up and forget about it – the app does all the hard work for you. Automatically detects and remembers the places you visit – including place name/address, date and duration of visit. 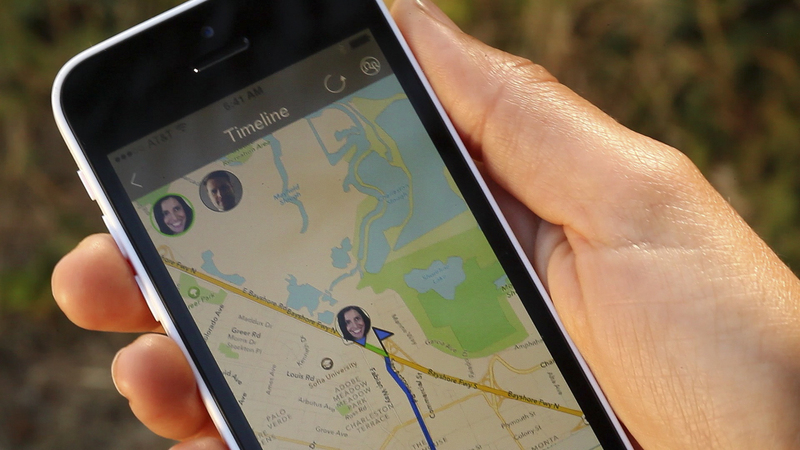 On-the-Go feature provides real-time location updates for when a connection is in transit. Save and view your favorites. Also, automatically ranks the Top 10 places you visit the most. Runs in the background and is optimized for battery efficiency. But what if I want to turn off PlaceUs for some reason, can I? 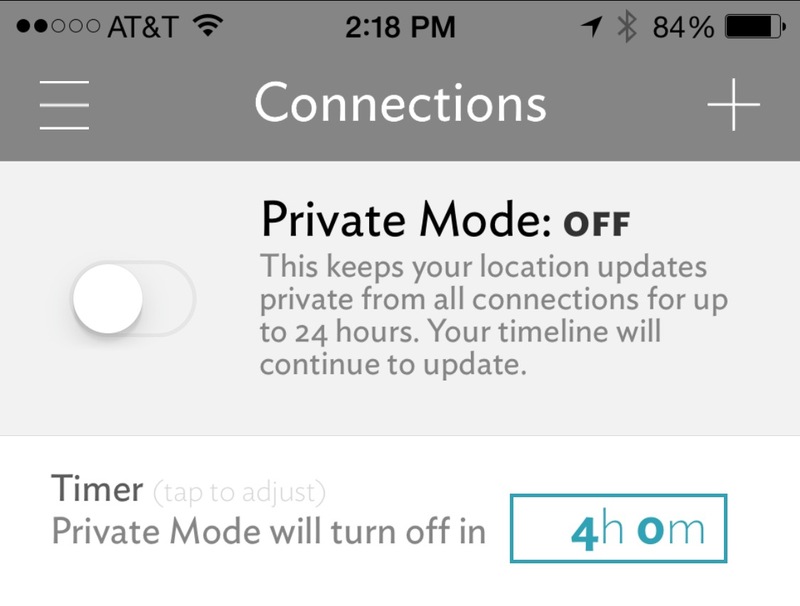 Privacy controls – So you can control who sees your locations at all times. So, I am so thankful I got to try this app. I truly am not a nagging wife who needs to know where my husband is at all times and do very much trust him, but to be honest it was nice to know when he was coming home from work, because as much as Kevin does usually help with dinner (seriously he can cook, too! ), it was easier then him phoning me. And this way, I could start dinner for us and get things under way easier. For that alone this app was a winner in my book. Something so simple and yet something that did make my life that much easier (I am all for simple and easy with dinner time preparations by the way and who isn’t!). Therefore, Kevin could come home and jump in, but the main portion of the meal was already started. There you have simple, easy, totally making my life and Kevin’s (too) that much more manageable for family dinner time routines. A totally win-win for both of us! Thank you to PlaceUs app. « Emma’s School Star Week Plus 100th Wonderful Wednesday! I currently pay Sprint $10/month for the Family Locator which works. Guess what? I’m going to cancel and use this one. After all it’s free and it works. It’s time to save some money. Thanks for reviewing this! think this will come in handy when Dino is older…will have to mention this to hubby, though I think it might freak him out. Will tell my parents, I know they like to keep track of each other. Now that is one app I could use! Love that you can change the privacy settings! I always have to call my husband to check if he’s on his way to pick our son up from school and if they arrived home safely. Thanks for sharing Janine! I don’t think my husband would like to use this. He doesn’t think I know he drops into the bowling alley when he’s “running errands”. I don’t need and app for that because I just know when he takes to long to come back. LOL! This will be great for one day when Christopher gets a phone though, instead of locating him it’s just already on. I like that. I thought I was the only one that had to “check in” and girl I could NOT just not call my dad. He’d be waiting for me at the door when I got home saying, “All I asked you to do was check in.” I swear I was the only one that had to do it. When Christopher was older and running between houses here in the neighborhood I’d have him do the same thing . I cringed when I met him at the door saying the very words my father said to me. My mom would’ve totally had a smart phone! She loved working on her computer and learning new technology! OMG Janine, I’m so glad I read your post today! (I know I’m more sporadic these days in reading others, but I try to check in every so often! )…I am downloading this app ASAP! My oldest son just got his driver’s license (yikes!) and we keep telling him to text us before he leaves (usually he leaves school when it’s dark because he has basketball practice until 6pm), but he ALWAYS forgets…I sit there and worry like crazy bc he’s a new driver, it’s dark out, and his school is about a 15 minute drive away. This app is EXACTLY what we need – thank you!! Very cool! It would definitely be handy to know where Sam is when he is heading home after work and have a sense of when he’ll be home, since most days I text or call him to gauge when he’ll be back. Thanks for sharing! I use the Find my Friend app, but I think it only works with iPhones. This is a great alternative. Both of my kids have phones, and Gwen will get her license soon, so an app like this is a must! I definitely need to check out that app – since Jordan started driving himself to school this week I have him text me when he gets there and before he leaves to come home – he would much prefer this method!!! Just a slight correction to something you wrote….not everyone has a Smartphone. 🙂 Guess who doesn’t. Have a wonderful weekend my friend. Enjoy your down time, if you have any. Being a mom with all teenagers and one pre teen, I NEED THIS APP. My kids, especially my 18 year old who is a senior, hates calling me and letting me know he made it safely somewhere. I have a lot of catching up to do on my blog today since it has been converting to another host the past several days, BUT I AM DEFINITELY CHECKING OUT THIS APP THIS WEEKEND. Hopefully, later today. I used to use Find my friends but that isn’t on Android so it’s nice to have a replacement. Thanks! Definitely makes me wonder what will come out in the next ten years or so – when our little ones are out and about and we’re going to want to see what they’re up to. I think the future is already here. And this comforts, because I’m so not ready for those years. Janine, I refuse to believe you are a day over 28! I seriously thought you were my age! I love the photo of you and your mom on your wedding day. I remember the good old days of checking in. Honestly, I still check in with my mom and husband if I’m out by myself. This seems like a nifty tool! Wonderful! It helps a lot to know that your family and loved ones arrived to a location safe. Or probably when a phone gets lost or stolen? I guess you can track where it is too through GPS? 🙂 So pretty photo of you and your mom! This sounds so cool! I think the ease of mind that my husband is on his way when he has a later day at work unexpectedly. This works vice versa for me when I’m out too! Great review Janine! I have to admit, I’m still refusing to get a smart phone, because I know that it would dominate my day, which I don’t want to (yes, I’m an obsessive nature). And I always shook my head at elementary schoolers sporting cells and smart phones. But with Lily out and about all the time, I have really thought that it may be convenient getting her a pre-paid phone, just to be able to reach her should we need to, or for her to call us, should she need to. Right now, I know that she’d mostly use it for shenanigans, but I’m sure she’ll have a phone before she leaves elementary school! Neat app! Thanks for sharing, Janine! I’m so glad I read this today, Janine! I have to check this out…it would be nice to have an update from my kids without them having to check in and especially for my oldest son, who is often driving at night. He is great about calling us before he leaves, but this would give me peace of mind in case he forgets or just wants to get in the car and go. It would have been nice this weekend since everyone was headed in different directions…one kid to one ski house with a friend, my husband and youngest son and a friend to our ski house…and I was home with our oldest. Thanks Janine! And I love the re-design!! I now have my husband, daughter (Carly), and my son (Casey) on PlaceUS. Casey was reluctant, but since we pay his cell phone bill he gave in. Thank you again for this great APP. This is great. I can see how useful it would be for keeping track of teenagers! Technology could be an angel to all of us. Thanks for sharing this. First time I’ve heard of it actually. this is brilliant. i am bookmarking for when i have an iphone. i do have one, but it doesn’t have service…i only use it in the house when i connect to wifi.